There’s something about Amsterdam from the water that intrigued us. We wanted to know if there was a singular insight of the city that we are living and studying in that we ourselves are not experiencing. If seen from a different angle, specifically from those 150 canals we walk, ride of study by every day, does Amsterdam have a different culture? If looked at through this critical eye, it is no longer simply about location, but economy, politics, opinion, sociology. We ventured out into the city to understand how something as simple as getting in the water can transform the way we see the world around us. Vincent van Loon used to live on a houseboat at the Prinsengracht in Amsterdam. He noticed that a lot of people were interested in his house. “In the past, when I was gardening on top of my boat, people would pass by to ask me how I felt about living on water and if they could see the inside. They were very curious,” Vincent says. This gave him the idea to open a Houseboat Museum for the public. 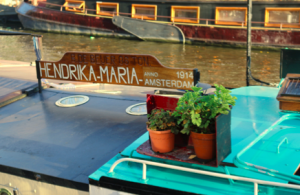 Eventually it led him to buy the Hendrika Maria boat in 1997, which is docked at the Prinsengracht in Amsterdam. 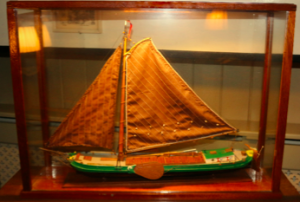 “After a lot of digging, I was able to piece together the history of this boat. The search brought me into contact with a lot of wonderful people and led to warm encounters”, Vincent says. The ship was built in 1914. At first it was used as a freighter. The captain and his family used to live in the front part of the boat, the cargo space used to be in the mid-section and the servant used to sleep in the rear portion. The boat type is called ‘Hagenaar’, which was ideal for transporting cargo by river. The Hendrika Maria would sail from place to place to transport goods. But when the sixties came around the corner, the boat was too small to transport those goods. Bigger ships were built to do the job and the Hendrika Maria became a boat where people would live in. Herman Stoel, a painter, bought the Hendrika Maria and turned it into his own studio. Because a painter needs a lot of light in his studio, he puts in a roof with a lot of skylight above the cargo hold. 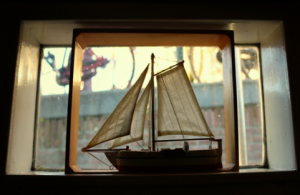 Herman sells his studio in 1979 to Wouter Freeling for 7,000 guilders, leaving behind much of the ships inventory. Wouter puts an enormous amount of work into the boat during the first year and finances the renovation with welfare benefits. He panels the inside of the hold to make the boat somewhat livable. In august 1982 Wouter sells the Hendrika Maria for 28,000 guilders to the last occupant Paul van de Zwart, before it converted into the Houseboat Museum. “Since we opened the Houseboat Museum we changed a few things, like furniture and we also removed the kitchen. But apart from that most of the boat is still the same as Paul left it,” Vincent says. In April 1997, Vincent va n Loon bought the Hendrika Maria. He wanted to give the Hendrika Maria an authentic look. He managed to get his hands on a mast and leeboards and gave the interior an old-fashioned Dutch look and feel. After an inspection and reconstruction he opened the Houseboat Museum on 5 September 1997. “In the first six months we had about 2,500 visitors. In the winter it used to be worryingly quiet. Fortunately, we got a lot of good press from foreign journalist and more travel guides mentioned the Houseboat Museum. This had an effect, as more visitors came every year. Nowadays we have 40,000 visitors per year,” Vincent says. The boat Hendrika Maria, which is docked at the Prinsengracht in Amsterdam, was built in 1914. It was first used as a freighter, but in the sixties the boat was too small to transport goods. From that moment on, the boat was used as a house and people lived in it until 1997. 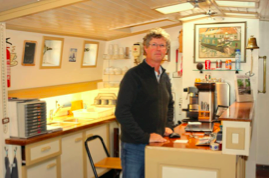 The current owner, Vincent van Loon, used to live in a houseboat at the Prinsengracht as well. He noticed that a lot of people wereinterested in his house. They would ask him how it is possible to live on a boat in the water and if they could see his house from the inside. Because of that he came up with the idea to open a houseboat museum for the public. And so he did. 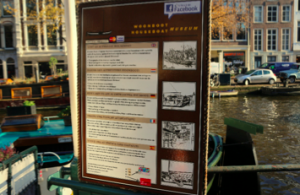 Explanations of the Houseboat Museum are available in many languages throughout the whole museum. 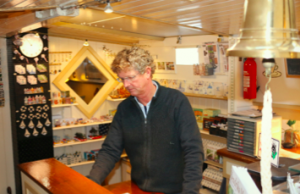 The owner and founder of the Houseboat Museum, Vincent van Loon, working behind his desk. A cozy corner in what used to be the cargo space. 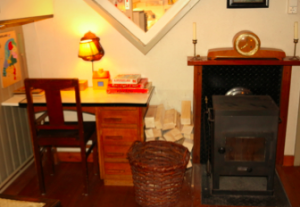 The black heater was in the past property of the previous owner. 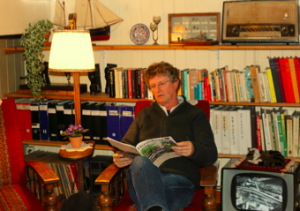 Vincent van Loon reading the Hendrika Maria magazine at his favorite spot on board. An example of a similar ship to that of the Hendrika Maria, is called the ‘Hagenaar’ type. 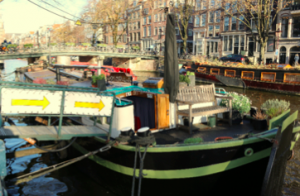 The Houseboat Museum from the outside at the Prinsengracht in Amsterdam, The Netherlands.